Heat an oven-safe sauté pan over high heat; add oil and sear halibut until golden brown. Transfer pan to oven and cook until the salmon flakes apart, about 7 minutes. 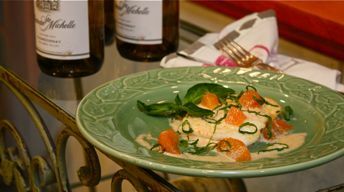 Top with Beurre Blanc and garnish with grapefruit segments. Place the juice of 1 grapefruit in small saucepan along with the shallots, garlic, ginger and paprika. Cook over medium heat until liquid is reduce to ¼ cup. Remove from the heat and whisk in the butter. Season with lemon juice, salt and pepper. Peel and segment the remaining grapefruit and toss the segments with basil. Use to garnish the halibut.